I have always dreamed of attending NYFW but never thought it would be a reality for me. Every fashion magazine or television recap features celebrity sightings or beloved fashion editors. What business does a stay at home mom have attending NYFW? Well now I can say that this stay at home mom attended and it was an absolutely amazing, dreamlike experience! When I first walked into the fashion show, there were so many photographers which was completely expected. What I was not expecting was the amount of photographers wanting to take photos of me! I felt like I was transported to another world! Literally that morning I was packing snacks and lunch for the kids and then the next minute I was posing for photographers and feeling like a celebrity! The day I attended NYFW it was 90 degrees. The outfit posted above was the one I had styled and intended to wear. However, it was way too hot and I’m glad I was wearing layers so I didn’t have to sweat through my first show! It is obviously important to be fashionable for NYFW but you want to be comfortable as well. If you are planning to go to shows, try to dress or pack for any temperature so you are prepared no matter what. So how exactly did I score an invite to my first NYFW? Well, like everything in life, it is all who you know. I emailed a couple of different PR agencies a week or so before NYFW but unfortunately, I did not hear back from any of them. I’m not sure if the right person received the email or if they were too busy to even read them. Next, I reached out to Amanda, (The Fashion Foundation Founder), to see if she was attending any events. Amanda mentioned that she was going to Nolcha shows and offered to reach out to her PR contact and see if I could attend as well. Next thing I knew, the PR contact sent me an email and I scored an invite to my first show! 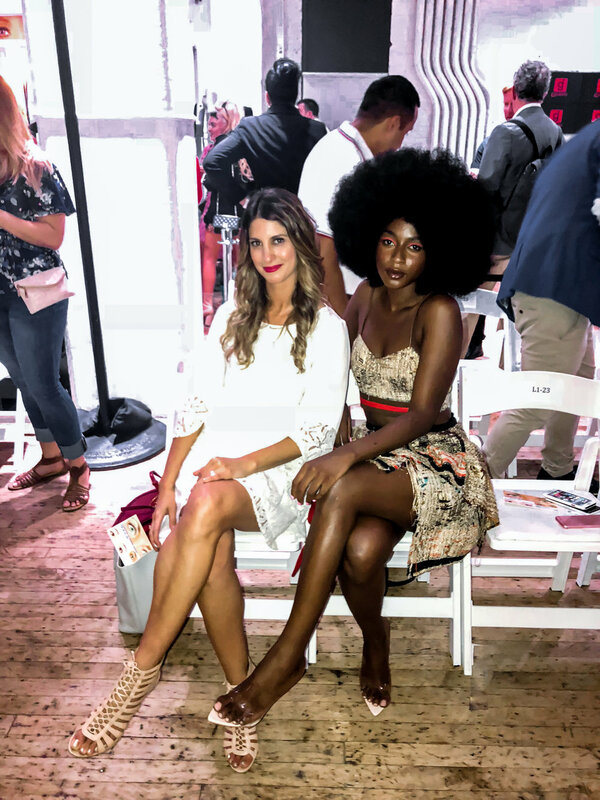 One of the best things about NYFW, besides seeing the amazing clothing, is getting to meet other bloggers in the same industry. Most of us spend our days behind the camera or computer and it is easy to miss the social engagement we used to have when we worked in an office. Meeting other bloggers is a great way to share experiences - for better or worse! Once the Fashion show began, I was excited by the music, lights and beautiful assortment of clothing being featured. Watching the runway shows on television does not do it justice. Everyone had their phones out, snapping photos, taking videos, and enjoying the show. I photographed a couple of my favorite outfits and did a little video taking myself (which you can view below). There is one outfit I did not get a photo of, and it was my favorite. The reason I did not get a photo, was almost the reason that I became banned from attending any future runway shows. So here I am, snapping and videoing away when I see this beautiful purple dress. I quickly grabbed my phone, fumbled it, and it landed almost in the middle of the runway. I was absolutely mortified and felt like a deer frozen in the headlights. I wasn’t sure what the right thing to do was. Do I get out of my seat, or just wait until the model passes by? I tried to stretch my leg out and grab it under the radar, but then I thought, what if I trip her?!? I decided to make a quick dash out of my seat and grab it. The only people who seemed to notice were the guys sitting across from me who were now laughing. Thankfully it was a painless ending to my almost mortifying story! After the show it was time to head back to real life. I jumped on the LIRR and headed home to pick my kids up from their friend’s house. NYFW was a memorable experience and I am hoping to have many more opportunities to attend in the future! I’m sure I will have more stories to tell if I do!